Looking for a hassle-free way to relocate your retirement funds? An IRA transfer might be what you are looking for. Learning how to transfer an IRA will make the process easier, and Janguard believes that the best clients are informed clients. As opposed to an IRA rollover, you never receive the money yourself so there are no potential tax penalties to consider. You can make as many transfers as needed, whereas the IRS only permits individuals to make one rollover per year. While an adviser might be helpful when handling retirement funds, here are some basic steps to help guide you through the process. Research your IRA Transfer options. When conducting a transfer, you will be relocating funds to a new company or institution. Unlimited transfers are permitted to be made throughout the year, but many companies require a set-up fee, annual fee, or termination fee to make up for labor and paperwork expenses. When searching for a new home for your funds, take the fees you will incur into account and guard yourself from being blindsided. If you can, consolidate your assets in an IRA transfer. This means combining funds from multiple accounts into one account including a 401k rollover from any inactive accounts. Numerous benefits can be gained by taking this action, including saving money on annual fees and making your retirement goals easier to track and manage. You will receive one quarterly statement rather than several envelopes from different custodians. Also, transferring all of your assets into one account can potentially save money on set-up fees, rather than transferring your funds to a new account. In terms of mutual funds, consolidating into one “fund family” provides benefits as well. There is a chance you may receive what’s known as “breakpoints”, or lower fees due to the higher amount of money you have with that single fund family. Transferring “in-kind” means not having to sell any of your assets before conducting the transfer. With some types of institutions, such as mutual fund companies, insurance companies, or banks, they may require that you sell your assets before relocating the cash. If in-kind transfers are not allowed, you will simply re-invest the funds once they have arrived at the new institution. This may not be the most fun part, but it’s necessary. This paperwork helps you access and fund your new account. Be sure to have the latest statement for your old IRA handy to help ease the process. Read through each section, sign, and return to your new account administrator. It is highly recommended to enlist the help of a Janguard IRA adviser for this step in the process, as free help from experts with years of experience assisting with IRA transfers will surely speed up the transfer. Remember taking tests in school and your teacher telling you to read each question carefully? You may not have heeded that advice then, but it is extremely important to adhere to it now. It will save you a lot of potential problems down the line. Be sure that all of your information is correct and written clearly. To prevent a delay in the processing of your transfer paperwork, check with your current custodian to determine if you must sell your assets before submitting the forms. When transferring an investment with a maturity date, be sure to verify that your funds will transfer at maturity, or you may be subject to an unwanted early withdrawal penalty. Some custodians request forms to be completed and submitted in a very specific way, and they may reject your paperwork if you do not follow their guidelines. To prevent delays, it might be helpful to ask one of Janguard’s IRA advisers to help you complete the forms. Once you have submitted your transfer paperwork through the proper channels, you will receive notice that your new account has been opened and funded. At this point you are ready to invest in your IRA investment options. You will receive quarterly statements regarding the worth of your IRA, and you can contact Janguard at any time to make changes. 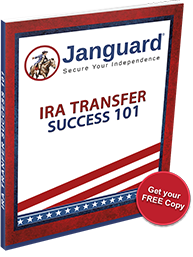 Now that you know how to transfer an IRA, you can get started today by calling Janguard toll-free at 800.571.6341 and speaking with one of our non-commissioned IRA advisers about securing your independence with a self-directed IRA.